Alas the picture doesn’t do this morning’s sunrise justice! Last spring, I fulfilled a life ambition and travelled to the island of Martha’s Vineyard in the US. Whilst there, my friend and I rose early to stand on the beach and watch the sun rise over the Atlantic. It was a profound experience for me; an enormous sense of gratitude for simply being there as well as awe at the beauty of it. It felt like a wonderful moment to be alive, witnessing the birth of a new day. This morning, I glanced out of the kitchen window and the stripe of candyfloss blue and pink over the valley below made me catch my breath. 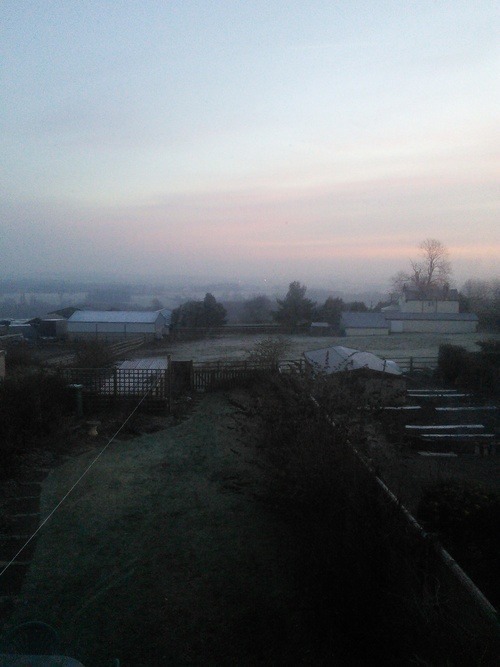 As the rising sun began to burn away the winter mists, the scene became a streaky watercolour, a soft rainbow of grey, blue, pink, orange and white. It was like the new day whispered good morning, lazily stretching itself across the sky. No drama, no hurry, just easing into life. The quiet magic drew me in, enfolding me in its warmth. I stopped what I was doing and just looked. Eager to make the moment last as long as I could, I switched off the electric bulbs before continuing to unload the dishwasher and clear away the breakfast pots in the gentle aura of the emerging daylight. I may never go back to Martha’s Vineyard, however much I hope to return. I may only ever see the sun rise or fall over the ocean a handful of times in my whole life. Yet the sun comes up and goes down wherever I am; it did so long before I came along and will continue to do so when all memory of me is gone. So why don’t I notice it in the ordinary places, only the extraordinary ones? Why do we search for meaning and poignancy in special occasions and faraway places? Why not start where we are? Look up, look around, treasure the everyday miracle of our lives. Amazing riches are all about us, like secrets hidden in plain sight. I invite you to join me, today and over the week ahead, in a special game of hide-and-seek. What secrets hidden in plain sight can you find in your life? What gems are before your very eyes, should you look for them? What do you see around you that you too often miss? What are you searching for? Where can you find it? Where in your life might it already be hidden? If you would like some support and guidance in undertaking such a search, or if you’re struggling for answers to these questions, then get in touch about having a coaching session. Part of my mission in working with people to create lives of their own is about helping them to deepen a sense of meaning and connection in our everyday worlds. My new training rate price is £35 per session (c$52 / c€46). If you book for a course of six sessions, the cost is £175 (c$262 / c€232); payment in installations is possible. Send me an email at rae@alifeofonesown.co.uk to find out more.